Waste management systems can be divided into a number of steps from collection, storage, transportation, processing, treatment, recycling and final disposal. Integrated solid waste management refers to this entire process and aims to maximise resource use efficiency, with minimal amounts ending up in final disposal sites. During Practical Action’s recent work in the South Asia region, we have gained particular experiences in terms of firstly waste collection, storage and transportation; and secondly waste processing in particular of organic waste. In many cities, waste collection services fail to reach all areas of the town or city. People are left to manage their own waste, which they do by burning and burying it, or dumping on open spaces. Sometimes large bins or skips are provided but they may be irregularly emptied, and also overflow when the contents is picked over by waste pickers and animals. In Bangladesh, in order to help increase the overall capacity for collecting household waste, Practical Action has promoted a door-to-door collection service run by local NGOs. Residents pay a service charge in addition to their municipal rates, but in return they receive a regular service, leading to a cleaner neighbourhood. In Faridpur, the local NGO, WORD, with technical backstopping from Practical Action serves more than 5,000 customers with waste collection. There are three main types of customer, non-slum households, slum households and institutions. Slum-based households are charged the lowest tariffs (minimum BDT 10) while the institutional rate is highest (minimum BDT 150). The numbers of slum households is small because the alternative option of localized composting (with a barrel system) was widely taken up. This is easier than collection through vans and is useful for slum people as they can use the compost later. Waste collectors use small rickshaw vans for the collection service. Recently we have also introduced small small rickshaw vans and small motorized versions for the collection service. The waste is taken to a composting facility where it is sorted and the organic portion is separated for composting, and in some cases for generating biogas. In 2008, WORD started the waste collection business with only 525 customers. In the last 8 years, the number has increased more than tenfold (5,100 customer per month) making the solid waste management a viable business. It has not only contributed to a better living environment, but also generated green and dignified jobs for 21 waste workers. The municipal conservancy department continues to play a regulatory and coordinating role through the Waste Management Steering Committee. This meets regularly to discuss any emerging issues and review the progress of door-to-door collection services. The conservancy department continues to manage the sweeping of streets and drains, and collection of waste from some areas of the town, from vegetable markets and slaughter houses. The only recycling and reuse of organic waste is done by WORD, as all municipal waste for now continues to be disposed at an open dumping site where no further treatment, sorting or reuse takes place. In Nepal, Practical Action has facilitated organic waste management under a public-private partnership model. For example, in Butwal Municipality, a private firm, Marry Gold Concern, collects and manages wastes from 400 households with a monthly service fee of NPR 50 (GBP 0.33) in an area called Ramnagar. The company employs three operators for collecting and managing waste from low income communities. A compost plant has been set up which processes up to 10 metric tonnes of organic waste and generate 5 metric tonnes of compost per month. In addition, recyclable waste, mainly plastic, is sold to scrap dealers, creating another source of income. In Bangladesh, collection services have been organised through existing local NGOs. In Nepal, Practical Action has instead helped to form different groups of Informal Waste Workers (IWW) such as street waste pickers, waste segregators, pheriya (dry waste pickers), scrap owners and door to door collectors. We have worked intensively with IWW from five municipalities of Kathmandu Valley. We have facilitated the establishment of a IWWs association called Samyukta Safai Jagaran (SASAJA), and the first waste workers’ cooperative with the same name. These organisations have distributed identity cards to members to increase their recognition as an ‘official’ part of the waste management system. We provided basic safety equipment to 5,622 IWWs, including rain boots/shoes, gloves, masks, raincoats, windcheaters with trouser and wrapper, aprons, cap etc. to minimize health risks. 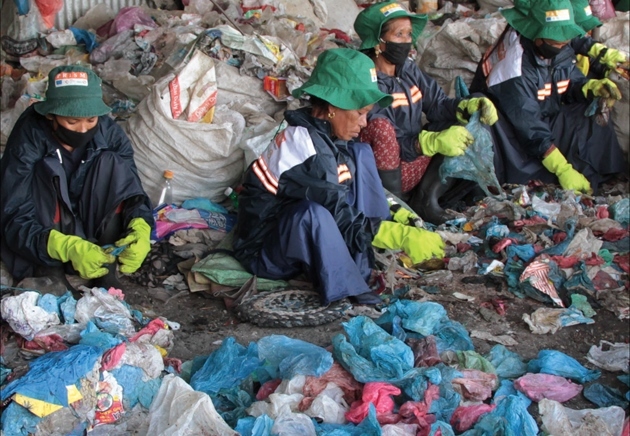 Basic safety equipment is essential to minimize health risks to informal recycling sector. Following capacity building and skill enhancement training from Practical Action, many of the IWW group members have established waste-based enterprises. For example, plastic tearing (PET bottle and carton crushing or pressing) for recycling and reuse; paper recycling and mechanical composting of organic waste. This approach has been scaled up in other municipalities in Chitwan and Rupadehi districts reaching around 350 IWWs there. In Nepal and Sri Lanka, and in some slum communities in Bangladesh, we have promoted barrel composting of organic waste. This has the dual benefit of producing compost locally which can be used for home gardening, and reducing the amount of waste that needs to be collected and disposed of elsewhere. It can reduce the amount of organic waste coming in to the waste collection stream by about 20-30%. It requires community involvement in waste management system as well as frequent monitoring and troubleshooting. This process ensures source segregation of waste, a necessary condition for proper implementation of the 3R system (reuse, reduce and recycle). Practical Action has distributed more than 2,000 compost bins in Sri Lanka. Especially in Galle, Kurunegala and Akkaraipattu cities where we have distributed about 1,500 home composting bins from 2006 to 2016. More than 65% of the bins are being regularly used. Our experience shows that once a locality is provided with home composting, the volume of organic waste into the municipal collection system is reduced around 20-30%. However, this varies greatly by locations. If the local authority strictly monitors the compost bin usage and provides troubleshooting support, waste reduction can reach up to 30%. Both Kurunegala and Galle municipal councils have upscaled the distribution of bins city-wide with the support of national government funding. This technology was taken up by the private sector and other municipal councils. It has been used widely in the country as a solution for reducing organic waste coming in to the waste collection system. For example, Kandy municipal council has adopted the technology with strict restriction on organic waste collection in the municipality collection system. The Provincial Agriculture department in Kurunegala and the Coconut cultivation board in Akkaraipattu are both promoting organic agriculture with the usage of composting and are using Practical Action’s work as examples for expansion. The central government has provided seeds and fertilizer to city dwellers, including the urban poor, to promote home gardening. This has been further expanded by Kurunegala municipal council which has distributed potted plants. Some of the vertical gardening structures promoted by Practical Action are now included in urban gardening models of the Western Province Urban Agriculture unit. Tagged Bangladesh, Compost Bins, Composting, Municipal Council, Nepal, NGOs, organic waste, Practical Action, Recycling, Slums, South Asia, Sri Lanka, Waste Collection, Waste Management, Waste Management in South Asia, Waste Pickers. Bookmark the permalink.